The following is a letter written in July 1981 to an author of popular aviation publications, by a former member of the German 'Nachtjagd', Oblt. (Dr. Ing.) Rudolf E. Thun, who ended the war as Staffelkapitän of 9./NJG 6, with 7 confirmed victories. Thanks for your letter of June 22. I am glad to contribute some of my experiences flying the Bf 110G. Naturally, limitations of time and memory will constrain my remarks to not much more than a few flashbacks, and perhaps not always absolutely accurate ones at that. First a short summary of my World War II service in the German nightfighter corps. I had started the war as an infantry man, but obtained a transfer to the Luftwaffe after the French campaign. I went through officer's school and various training assignments including Fighter School in Ingolstadt and Night Fighter School in Schleissheim near Munich, until I joined II/NJG 5 in early 1943. II/NJG 5 was then commanded by Major Rudolf Schoenert who achieved a total of 64 confirmed kills and is now a Canadian citizen. After flying a number of day and night sorties primarily in the defense of Berlin with Bf 110 aircraft, I did a stint as a test pilot from the late summer of '43 to early '44. Shortly after my return to combat, I got the assignment as technical officer of III/NJG 5, and we transferred to Hungary and Southern Germany. On 5/10/44 we became III/NJG 6, and shortly thereafter I was promoted to squadron commander of the 9th Squadron, III/NJG 6 which was equipped with Ju 88. From then on to almost the end of the war, I flew Ju 88 aircraft in combat and got credit for 7 confirmed air victories. I usually flew aircraft with the marking C9 + AM. I believe that Rudi Schoenert was the first who installed fixed, 75 degree elevated cannons with a separate gun sight in his Do 217, and our weapons sergeant Mahle made also the first "Schräge Musik" installation in a Bf-110, the plane of Cpt. Wilhelm Johnen. Mahle later pioneered under my direction the first "Schräge Musik" in a Ju 88 when I formed 9./NJG 6. This pair of vertical guns permitted a major breakthrough in night fighter tactics since it facilitated a very accurate attack from below where the dark background generally prevented detection by the crew of the attacked bomber. The 30mm MK 108 was disliked by most experienced crews. First, the muzzle flash was much too blinding for effective use at night, and secondly, the gun spring would not contain the pieces in case of a shell exploding in the barrel. Even though the German 20mm and 30mm ammunition was extremely reliable, the MG FF or MG 151 provided added safety in this respect. Accordingly, the preferred equipment of the G-4 was MG 151's forward and MG FF's for the "Schräge Musik". Experienced crews, by the way, never used tracer ammunition. A few G-4 were delivered with GM-1 boosters, and I was once stuck to fly such an aircraft. (I think this was the G-4/U7). This was a quite useless modification. The added speed was not needed at night, we never had nitrous oxide in the first place, and the reduction to two crew members was a serious handicap, having a pair of eyes less. During the '43-'44 time span, while flying day sorties against American bombers, we had our 110's armed with four 21cm (8") diameter rockets. These rockets had only an effective range of 800m, flew in a wide spiral, and reduced the performance and handling of the aircraft very considerably. In fact, one of our planes equipped with these rockets and its bulky carrying rack, crashed during the start just by flying into the propwash of the plane ahead. The ETC 500 bomb carriers were delivered with the planes and kept in the inventory until mid '44. 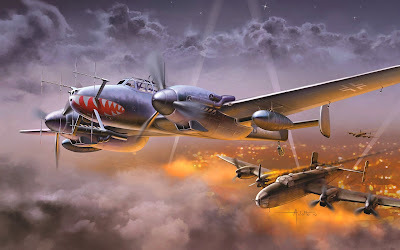 By the time we needed them flying night ground attacks against the Russians we had of course scrapped them and were limited to using gun fire in these ground attacks. As you probably know, the radar installations and other electronic equipment varied considerably, even within a series. Early G-4's had the Fu G 202 or 212 (Lichtenstein) together with the SN-2, and the antenna polarization varied. Later on, the SN-2 had an adequate minimum range and the Fu G 212 could be eliminated. Only a fraction of the G series was equipped with Fu G 218 Neptun and/or Fu G 350 Naxos Z. I even had some planes delivered with the Fu G 101 (radio altimeter) indicator, but without the transceiver, probably because they didn't have any on the production line and did not want to delay delivery. A short word on the camouflage paint. Contrary to present beliefs, not too much thought was spent on this question. There was a general recognition that a light, mottled gray or blue-gray was hard to see at night, but beyond that, some lowly mechanic with a spray gun usually had a pretty free hand in spraying a pattern to his heart's desire. Well, how did the Bf 110 fly? I started with an E which was badly rigged and a total dog. The F without radar was probably the best flying 110, fully acrobatic and in some respects smoother than the Bf 109 where the slats made some racket when wringing the plane out fully. The 110F, of course, didn't have the performance of the 109. Once I got a good 110F with a lot of patience to over 11,000m, just for fun. The 110G-4 was sort of a mixed bag. The aerials, exhaust flame dampers, drop tanks, other paraphernalia and, of course, the excessive weight when compared to the original design, resulted in a very limited performance and handling envelope. Single engine flight was barely possible with full rudder, and in this case the rudder force was extremely heavy and led to rapid fatigue. On the other hand, visibility was excellent, and the control forces pleasant and well balanced when flying reasonably within the performance envelope. This made the Bf 110G-4 an excellent gun platform, and since speed was of no great importance against bombers, the Bf 110G-4 was a quite good night fighter. I personally, though, preferred the Ju 88. For day sorties, of course, the Bf 110G-4 was completely inadequate, and we paid with heavy losses which forced the termination of day sorties in early '44. During the period where night fighters were controlled from the ground within the range of ground radar, no serious electronic counter measures were encountered. The limitations were essentially that of the Lichtenstein radar and of team work and skill. During the period of the "Zahme Sau" where the night fighter forces were directed into the bomber stream and followed it through the target area, the success of electronic counter measures by the British was spotty. By that time, the fighter aircraft were equipped with the SN-2 which gave a decent detection range and permitted a skilled operator to distinguish between enemy aircraft and the metal foil curtains they dropped. More effective toward the end of the war were the very powerful airborne jammers the British used, since the long wavelength of the SN-2 made it quite sensitive to jamming. In summary, the electronic counter measures used by the British were never a major deterrent to experienced night fighter crews, but they were probably quite effective against the younger, less experienced crews on which the night fighter groups had to rely more and more. Finally, a few vignettes on personal experiences, just to give a flavor of that long ago war in the night sky of Germany. Being a night fighter was mostly waiting during the evening and night hours, waiting for the bombers which, as often as not, did not come. Few slept, since scrambling into low clouds at night was a strong incentive to stay alert. So, in quiet nights, you played cards or chess or read a book, and finally went to your quarters at 2 AM or so. Night fighter units were technically as complex as they come and required a lot of detailed supervision. The elder staff officers were often useless. That meant little sleep for technical officers and unit commanders who were also all combat pilots. - scramble about 30 Bf 110's from Parchim and Greifswald and fly toward an assigned rendezvous point north of Berlin to pick up our fighter escorts, a group of Bf 109's. We finally see them at the horizon, but when they come closer, they turn out to be a large formation of American P-51 Mustangs. We hastily form a Lufberry circle, but there was nothing which could have saved us from an attack of these far superior fighters. Fortunately, during these first air raids on the German heartland, the Americans were very careful. After circling us for awhile, the Mustangs took off after their bombers without attacking. Saved for another day. During the American daylight air raids, the German tactical command - the fighter divisions and Luftflotte Reich - was seriously hampered in directing the air battle by a general confusion about the air situation. As a remedy, Bf 110s of a 'destroyer' wing were used for tactical reconnaissance. Unfortunately, every plane was lost to American fighters. When I came back in early '44 to II/NJG5, from a stint as test pilot I volunteered to fly a few of these reconnaissance sorties. I changed tactics and flew very low, thereby avoiding detection. On one of these flights, I caught an American pathfinder, a B-24 Liberator, flying by itself. Since I had to climb up, I had to attack from behind, and with not all that much speed advantage. My 20mm cannons had only an effective range of about 800m against a 1500m range of the very accurate American .50 caliber (12.7 mm) machine guns. It took an eternity to fly through their fire, but I finally got into shooting position and brought this Liberator down in flames, the crew barely having time to parachute. After landing, I counted over 50 machine gun hits in my plane. And none of the other 9 or 10 Bf 110s of our Group which had sortied that day returned. Of course, most crews came back after awhile, parachute under arm. That was the end of the participation of night fighter forces in daylight air battles over Germany. This was my first day of annual leave, and my bride to be had already left by train. But as a 'Berliner', I scrambled for this British night raid on Berlin. And here I was, flying at 4800m altitude over Berlin, dodging German flak when the little puffs of smoke come too close to the tail, and waiting for the British bombers which are still 10 minutes away. Suddenly, I am engulfed by the brilliant brightness of 5 German searchlights. They don't react to our coded signal flares, and suddenly, 20mm shells impact my cockpit and the left wing - a German night fighter is attacking! (With auxiliary tanks under the wings, the Bf 110 could be mistaken at night by an inexperienced crew for a four-engined bomber). The plane is on fire and we parachute into the darkness. On the ground, the Flak commander is very apologetic, and my Division commander lends me his liaison plane to get a change of clothing and to start my vacation. Never work overtime in combat!! Mid-'44 in Hungary. The 105th British Bomber Group flew night raids from Foggia, Italy, into southern Germany and provisioned partisan groups in South-east Europe and Western Russia. These British crews were well seasoned and very sharp, but they suffered from obsolete equipment, flying older Halifaxes, etc., and even some Wellingtons. A week ago, over the eastern Alps, I had one of these bombers in my radar, but that fellow got away by diving deep into one of the pitch black valleys, at the risk of slamming into the mountains. Yet over the last few months, we from the III/NJG 6 have extracted a heavy toll from the 105th Bomber Group, just about wiping them out once over. So, they are now attacking our airfield, and we barely got into the air before the bombs fell. My radar doesn't seem to work or is jammed, and I am straining my eyes in vain for a bomber. Suddenly, about 2000m ahead, a tail gunner uses his flashlight for a moment. The rest is easy. Diving under the bomber, until it's dark, large silhouette is directly above me. Then a salvo from "Schräge Musik" into the left engines to give the crew a chance to get out - the "Schräge Musik" shoots with pinpoint accuracy. That was my easiest kill. An attack on Vienna. In the South-east, there was little ground radar guidance, so we try to pick up our targets over the bright sky of the raided city, with the fires and the British markers providing an eerie illumination. We got one on our radar, but boy, is that plane fast - it must be a pathfinder Mosquito or Beaufighter. I am releasing the drop tanks and revving the engines way beyond max power to 3100 rpm, and I am holding the speed of the target but cannot get closer. After 10 or 15 minutes I give up, relieved that the engines did not blow up. When I have landed, I discover that the drop tanks are still under the wing. That made for a very unhappy maintenance crew. Flying at night against the Russians was difficult, since the ground radar net was too sparse to provide much tactical information. The Russians flew infrequent and scattered air raids at night and gave the distinct impression, that they hardly knew where they were going or what they were doing. Moreover, they flew a lot of American Mitchell bombers which could be mistaken, at least at night, for a Do 217, a type which was flown in the east by NJG 101. I remember the night one of my buddies, a very successful night fighter, reported happily a Mitchell kill, only to learn to his dismay that he had gotten one of NJG 101's finest. Fortunately, the crew had safely parachuted back to earth. A week later, when I encountered a Mitchell, I looked at the thing at least for 5 minutes and from all sides before I shot it down. But my most difficult kill of a Russian airplane at night was an old, Russian-built DC 3 with rivets as big as on a ship's boiler, a crazy patchwork of odd- shaped skin panels, and slow, slow, slow. To stay with it, I had to get the landing gear and flaps down, and I had to shoot it down during weaving passes from behind. Still it felt good that at least once a German night fighter was too fast! I think we had many more losses through weather, mechanical failures and British night fighters than through the return fire of bombers. I will never forget the crash in Greifswald due to engine failure shortly after lift-off, the roll-over on instruments at a pretty low altitude due to a sudden failure of the auto pilot, the back flip during roll out on a muddy airfield in fog, or the sneak attack of a British night fighter while flying on auto pilot - fortunately, his use of tracer ammunition gave him away in time - or the many bomber and fighter bomber attacks we had to endure on the ground. Still, in this war of individualists, the experienced pilots and crews had a fair chance to survive. The toll taken of the younger, inexperienced crews, on the other hand, was very heavy, and I, for instance, lost all the officers of my squadron during the last few months of the war. Well, that should suffice to give you some impression of the Bf 110 as a weapons platform and of the battle in the night skies over Germany during World War II.